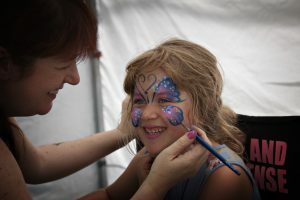 Available for parties, fetes, farmers markets, galas etc, facepainting is a sure-fire winner with all children. 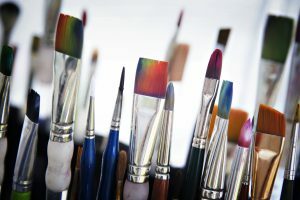 Whether it is just a cute little hand painting for the younger children, or a detailed rainbow coloured butterfly or scary dragon face for the older child, there will be something in our repertoire for everyone. Even mum and dad might find themselves tempted to be transformed into a tiger or kitten! We pride ourselves on our cleanliness and hygiene – one sponge is used per child for hygiene reasons, and all our equipment is thoroughly cleaned and checked at the start and end of each event. We have public liability insurance, and have checkable references available on request. 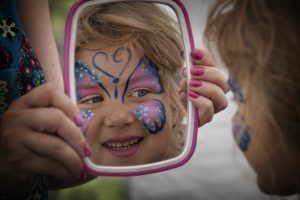 As with all things, you get what you pay for with face painters – if you are ringing around for prices (as we all do!) be sure to check whether your painter has these same standards.